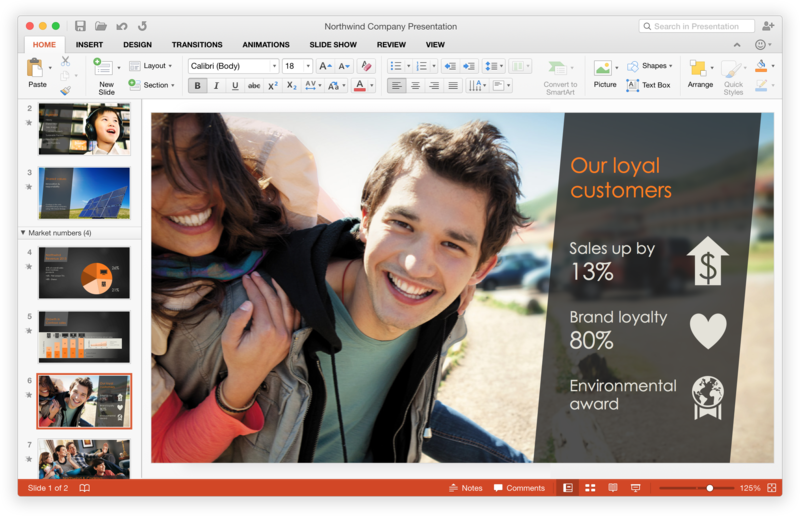 The Office 2016 Preview updates all five apps in Microsoft’s office suite: Word, Excel, PowerPoint, OneNote, and Outlook. The suite requires that your Mac is running Yosemite and, while the interface remains familiar, every application has a softer Yosemite-like look and feel. All the apps designed to work with Microsoft’s OneDrive services, including OneDrive for Business and private SharePoints, and are optimized for retina displays. According to Microsoft, Office 2016 is designed to unify the look and feel of the applications across all platforms, so that no matter where you use Office—Windows, Mac, iOS, Android, Web—the way you work remains the same. To that end, Microsoft has updated the “ribbon,” that tabbed toolbar running across the top of every Office document, so it looks like Office 2013 for Windows, and according to Microsoft, the user interface is now the same across all versions. Looking at the Windows and Mac versions side-by-side I’d say that’s accurate, although, to my somewhat biased eye, Office 2016 is easier on the eyes. The feedback form isn't going to disappear in the final release. If you want a little more workspace, the ribbon can be hidden with a single click on the currently active tab or by clicking a small arrow appearing at the ribbon’s far right side. Microsoft has also added a new “Help Improve Office?” button to the ribbon, which you can use to send feedback. According to the rep I spoke with, this isn’t a beta-only feature that will disappear once the product ships. 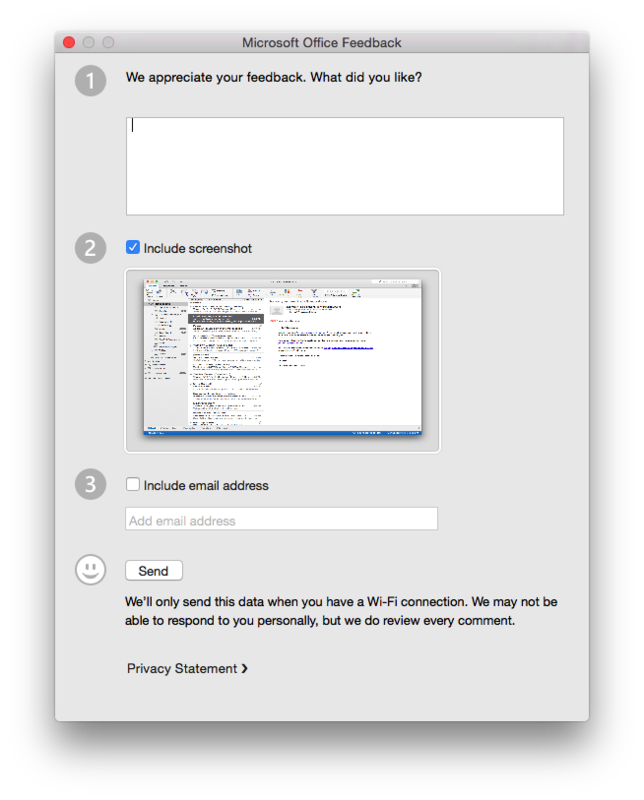 It’s designed to let you tell Microsoft about the things you do or don’t love about a particular product. True story: The Microsoft rep I spoke with said that this feature is no joke. He acknowledged that there is a public perception that any feedback of this sort gets sent directly to the bit bucket, but he assured me that he sees “telemetry reports” from these submissions on a daily basis. The aim of this feature is to help eliminate that public perception by proactively responding to reported issues. Office now supports Yosemite’s native full-screen mode, but does not support Yosemite’s native auto-save features nor does it support renaming, moving, tagging, or locking documents using the document title bar. And it should be noted that it’s unlikely you’ll see support for these features in any future versions of Office, as, according to Microsoft, Yosemite’s autosave feature and OneDrive don’t play well together. The one notable autosave exception is (pun intended) OneNote, which has had its own version of autosave and synchronization since it was first released. 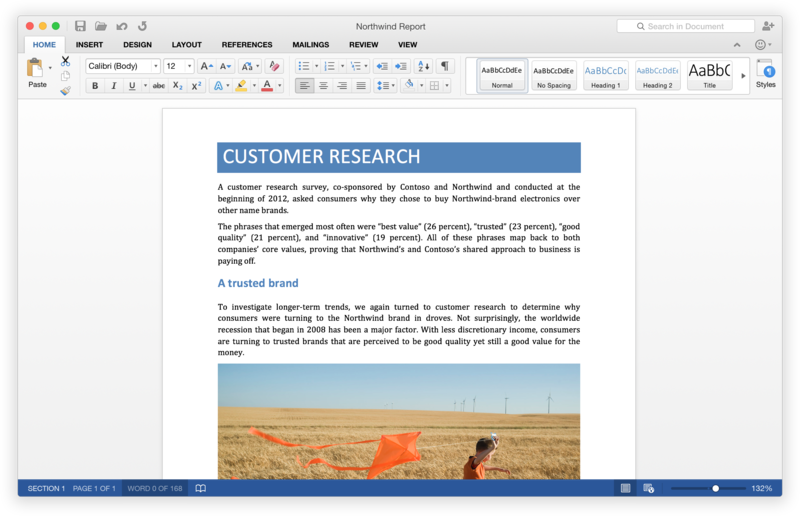 Word and PowerPoint share two new collaboration features: co-authoring and threaded comments. Co-authoring allows several people to work on the same document at the same time. The Microsoft rep wouldn’t commit to a specific number of total editors that could simultaneously make changes to a document, but did state that they’d seen it handle at least 10 collaborators at once. (A number that’s quite a bit north of what I’d hope to see working on any one document.) While editing, you can see who is working alongside you and also see the changes those users are making in real time. Excel offers several new features, but one in particular really caught my eye, as it’s likely to make the transition from Excel for Windows to Excel for Mac much easier for switchers. Excel for Mac now supports a majority of the Windows version’s keyboard shortcuts. So while all your favorite Mac keyboard commands still work, you don’t have to learn a completely new set of commands if this is your first time using Excel on a Mac. Control-C copies text in a cell, and Control-V pastes it. You’ll also find that Excel has more sophisticated analysis tools, including advanced statistical functions, slicers for pivot tables, and auto-complete features for inserting functions and filling in cell data. While I stated earlier that, because this is essentially a beta of Office 2016, I wasn’t going to take a critical look at any of the apps in the suite, I do have to point out that Outlook isn’t quite where it needs to be. While I was able to easily add my personal email account hosted on a private server, Outlook could not add my Gmail or iCloud accounts and, when attempting to connect to my Gmail account I immediately received a message from Google letting me know that someone knew my account password and was using unsecure methods to connect to their mail servers. OneNote remains one of my favorite Microsoft applications for collecting information on the fly. As this app has been regularly updated and remains free on the App Store, there’s not a whole lot more to report here, with one exception: If you’re using OneDrive, OneNote can now provide OCR for documents added to the cloud. I’ve only had a few hours to play with the Office 2016 for Mac Preview, which is not enough time to dig deep into each of these applications, but so far, I’m impressed. 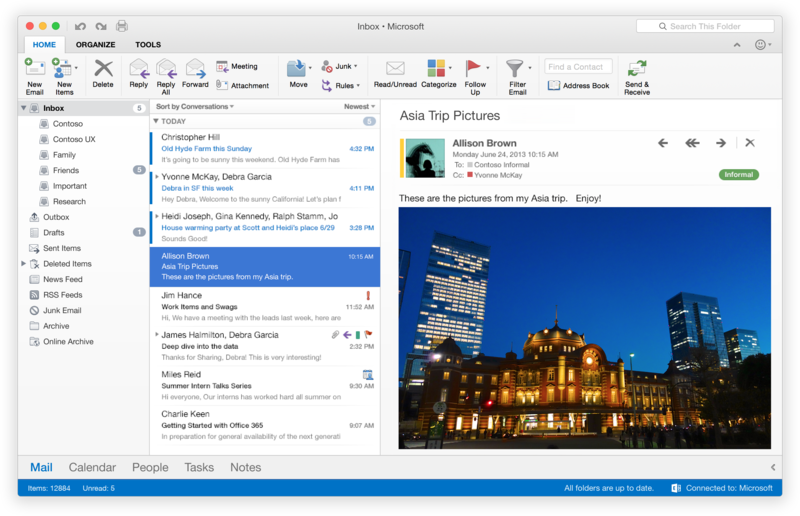 While this is essentially a beta, with the exception of Outlook’s connection issues, Office 2016 seems like a solid collection of well-designed applications. 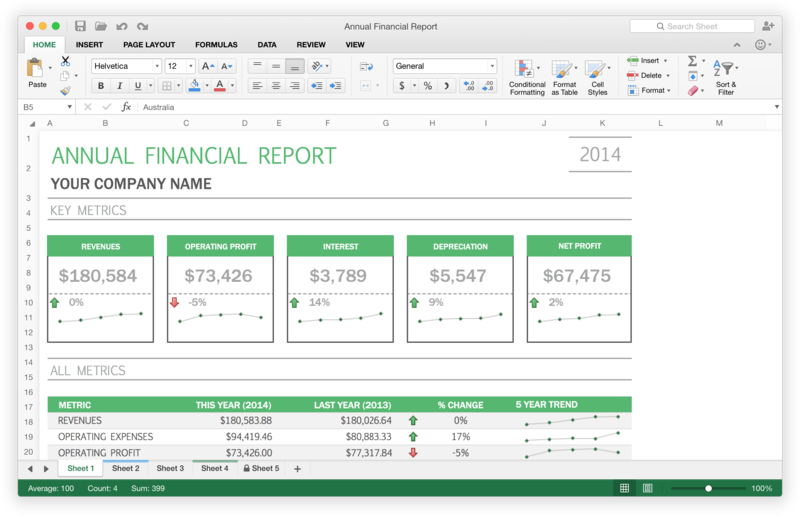 But more importantly, Office 2016 for Mac shows that Microsoft is no longer treating Mac users as an afterthought. This is Office on your Mac, just like it is everywhere else. Solid, seamless, and ready for work.